EUR/USD found takers at the 20-day low of 1.1681 and ran into rising trend line hurdle after the Fed minutes released in the NY session showed growing concerns among policymakers about weak inflation. The currency pair closed at 1.1766 and extended gains 1.1790 in the Asian session. The key data due for release are - Eurozone July final CPI at 9:00 GMT, Eurozone trade balance at 10:00 GMT, ECB minutes at 11:30 GMT. Across the pond, weekly jobless claims will be released at 12:30 GMT, followed by industrial production at 13:15 GMT and Fed’s Kaplan speech at 16:30 GMT. Sounds like a data heavy data, although the main event for the day is the ECB minutes release. The minutes due today are expected to shed more light on the discussion that took place within the governing council on inflation outlook, potential QE taper and the impact of the recent Euro appreciation on growth and inflation. On the inflation front, the minutes are likely to reiterate Draghi’s view that there are no convincing signs of a pickup in price pressure and that inflation currently stands well below the central bank’s target. Coming to exchange rate, the minutes are more likely to say that a strong Euro could cap inflation, but is also a sign of growing confidence in the Eurozone economy. Finally, more clues regarding a potential QE taper in September/October could move the EUR pairs as well. The bulls may regain control of the EUR/USD if the minutes hint at the September QE taper and sound upbeat on inflation and economy. On the other hand, bears may come-in strong if the minutes highlight concerns regarding weak inflation and EUR strength. Moreover, it would mean the ECB could delay the QE taper. The daily chart shows a descending triangle formation, which are typically continuation patterns. However, at times the descending triangles have worked as bearish reversal patterns as well. 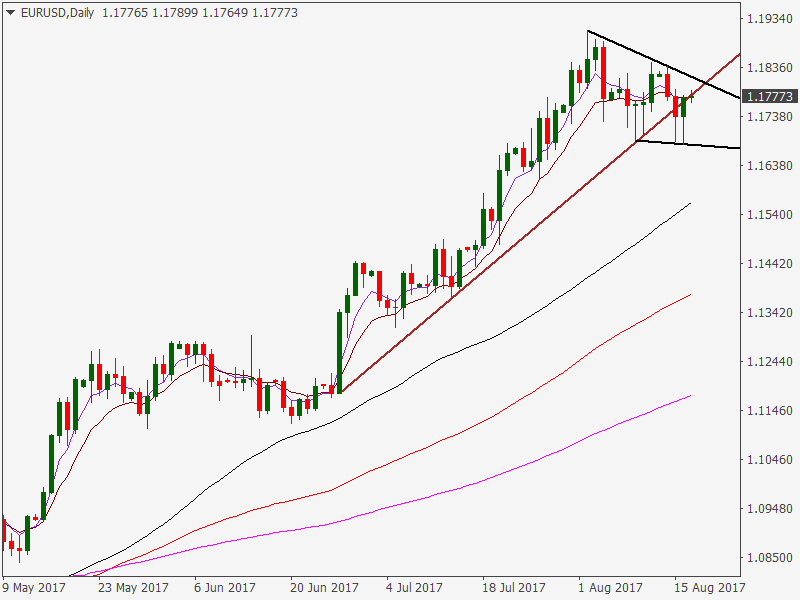 A break above 1.1812 [triangle hurdle] would open up upside towards 1.1848 [Aug 11 high], above which a major hurdle is seen at 1.1910 [recent high]. On the downside, breach of support at 1.1765 [Asian session low] could yield 1.1687 [triangle support]. An end of the day close below the same would signal trend reversal and open doors for 1.15 levels.